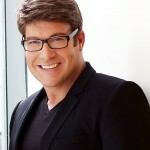 We are so saddened and shocked by the news of Chris Hyndman’s sudden death. Our healing thoughts and prayers are with Steven Sabados, his husband who shared his life with Chris for 27 years, his family, loved ones, friends, colleagues, fans…. Chris’ far reaching light, joviality, expressiveness and energy have touched the lives of so many. Thank you for making the world a better place, Chris.